Coverking Car Covers Custom made in USA, for cars, trucks, Vans & SUV's. The sleek fitting style of our best indoor cover with the ultimate outdoor protection. 3 layers of fabric create the most effective protection. The Mosom Plus custom car cover is made from 5 layers of fabric that stand up to sunlight, heavy storms, light hail, snow and rain. This cover is heavy-duty and suitable for vehicles in long term storage. Made from 4 layers of fabric that stand up to sun, UV, heavy storms, light hail and bird droppings. Silverguard Plus provides the very best sun protection while enclosing your vehicle with a soft inner lining. Great for use in desert climates. This cover is constructed from a unique polyester fabric with a silver reflective coating to protect your vehicle from the damaging rays of the sun. Triguard is made from 3 layers of fabric that stand up to sunlight and light storms. This cover is very durable and suitable for vehicles in long term storage. Coverking Custom Car Covers: Ultra custom car covers available in several materials and colors. Coverking custom car covers simply fit and look the best. Coverking uses large, one piece panels as opposed to other companies, whose covers look like a patchwork of small pieces sewn together. Coverking has engineered it's own fabrics to ensure it offers the highest performing fabric for every application. Coverking custom car covers are made in the California USA Factory and take about 2 weeks in production time. The Satin Stretch indoor cover is made with custom fit in mind. Each cover is designed and manufactured specifically for your vehicle for a tight and snug fit. For indoor applications or carports where the vehicle is not exposed to extreme weather. Triguard is a 3 layer fabric that protects from sun, UV and light storms. This cover is fit for light weather and suitable for vehicles in long term storage. 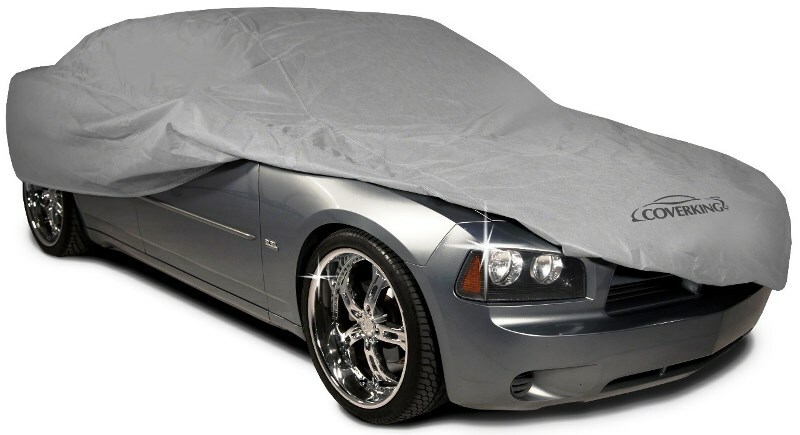 For a rugged protection, this car cover features UV-treated polypropylene 4-layers, reinforced double stitched seams and non-scratch security grommets. Coverking designs car cover materials in-house and contracts production of the fabric to the world's leading textile mills. Coverking refuses to use "off the shelf" fabrics - such materials rarely meet the unique and demanding needs of a car cover material. 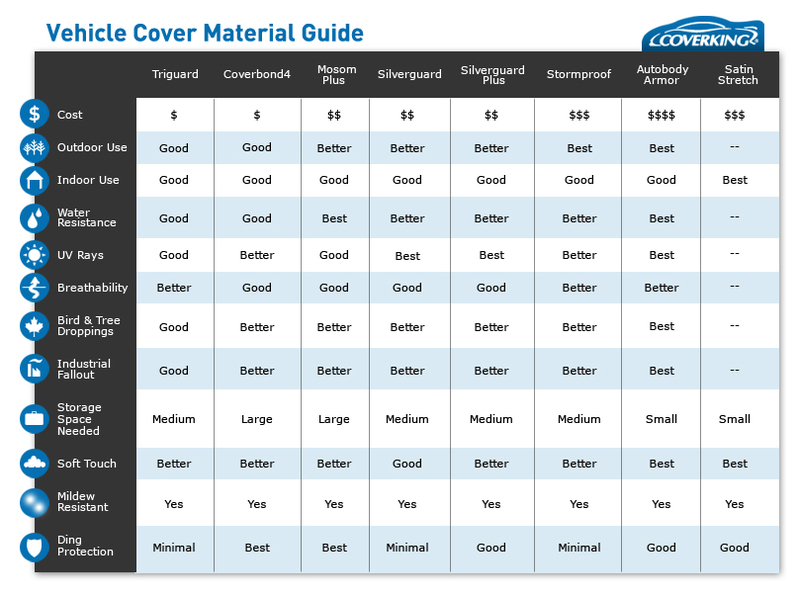 Following are detailed pictures, information and ratings of Coverking Custom Car Cover fabrics. Coverking Custom Car Cover Fabrics are developed under strict quality standards. The Finest Custom Car Covers Ultra-custom car covers available in several materials and colors. Coverking custom car covers simply fit and look the best. Coverking uses large, one piece panels as opposed to other companies, whose covers look like a patchwork of small pieces sewn together. Coverking has engineered it's own fabrics to ensure it offers the highest performing fabric for every application. Custom Car Covers by Coverking protect a vehicle from hazards while providing a clean, custom fit. 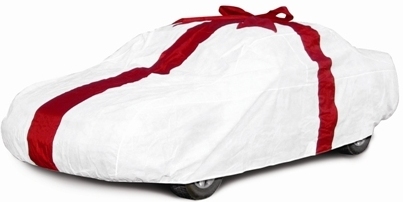 Coverking spares no expense in creating a custom car cover which fits perfectly, and with the fewest seams possible. Coverking developed the widest selection of custom car cover materials, choosing to engineer it's own fabrics instead of relying on "off the shelf" materials. Coverking has also pioneered the use of car cover fabrics in colors, two tone designs and reflective treatment. Coverking is officially licensed to silkscreen and embroider GM logos and other designs. Coverking Custom Car Covers are made using advanced CAD/CAM design and production systems. Coverking is TS16949 certified and QS-9000 quality certified. Customers are thrilled with Coverking Custom Car Covers. Even Monsoons can't get through a Coverking Custom Car Cover parked on an Island in the Indian Ocean! Coverking set out to create a superior Custom Car Covers in fit, material properties, looks, strength and features. Coverking Custom Car Covers protect the vehicle interior from fading, block prying eyes from seeing what's inside the car (and acting as a theft deterrent) and help the environment by reducing the need for car washing. Some Coverking materials can prevent minor nicks, scratches and even small hail damage. Coverking Custom Car Covers are a great way to protect vehicles parked at airports or near industrial sites. In very sunny climates, they keep the interior cooler and in winter they keep the snow off the glass. And because Coverking insists on using the fewest seams, Coverking Custom Car Covers look great! 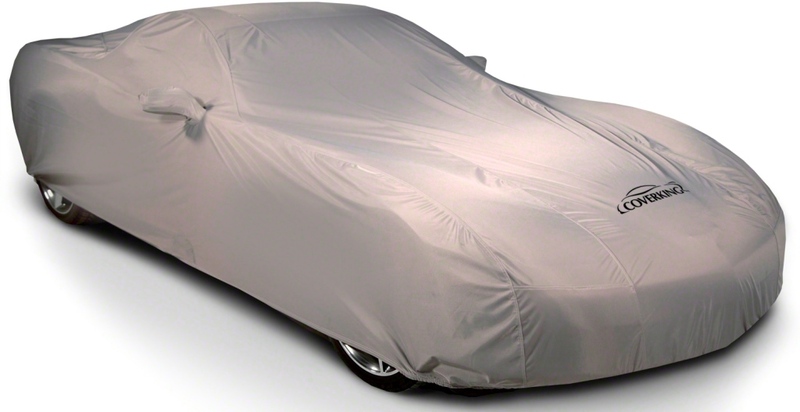 Car Covers use a lot of material, - 30 yards is common for most vehicles. In an effort to save material, some car cover manufactures use patterns which are "chopped up" into small pieces, and sewn together creating a patchwork effect. This method saves more than 20% of total material use, but results in car covers which look like patchwork quilts – seams everywhere. By having extra seams, risks of seam failures and seam leakage increase. In addition, the car cover looses it's custom look and resembles a universal cover. 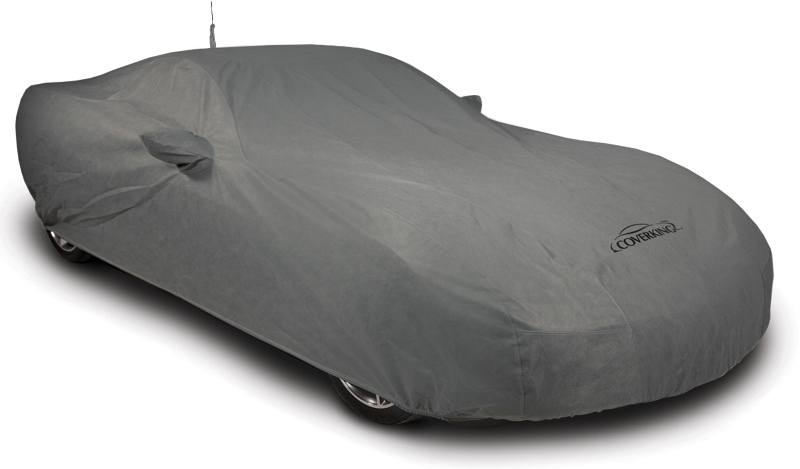 Coverking has never compromised the function or fit of it's Custom Car Covers to save a few yards of fabric. 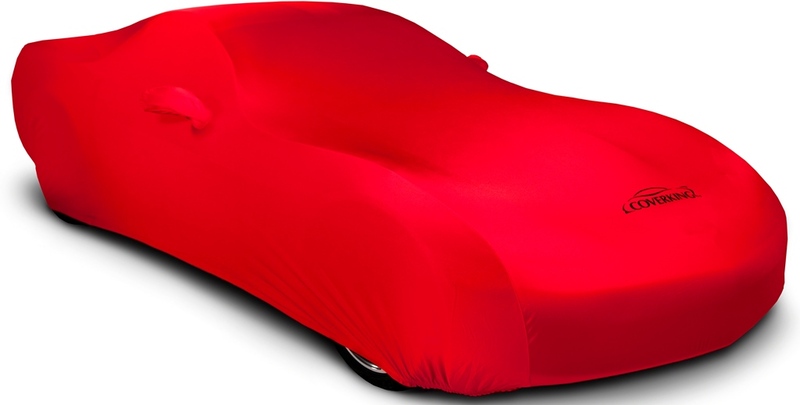 The qualities that make a Car Cover suitable for use depend largely on the fabric properties. Coverking designs it's own fabrics, and has the world's leading textile mills handle the manufacturing. Because Coverking has a team of engineers to specify exact material composition and construction, we are able to meet the most stringent material test requirements set out by the world's leading vehicle manufacturers. Coverking does not use "off-the-shelf" fabrics, which are ill-suited to car cover needs. 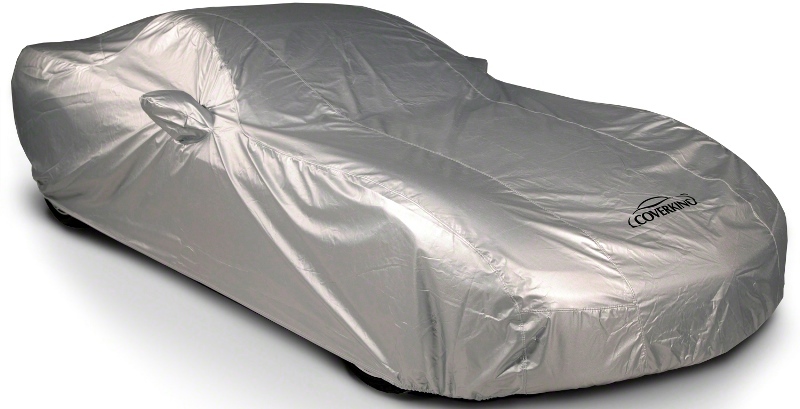 All Coverking outdoor Custom Car Cover materials are breathable – this allows moisture which is trapped under the car to escape through the cover, preventing a "greenhouse" condition of condensation which may result in rust damage. Coverking pioneered colored materials and two tone designs for outdoor use. Unlike other car covers, Coverking Custom Car Covers are designed to withstand the color fading effects of the sun. Coverking Custom Car Covers are designed and cut on sophisticated CAD/CAM systems, which Coverking pioneered twenty years ago. All outdoor Coverking Custom Car Covers are sewn using double needle and overlapped seams, resulting in a durable, leak resistant seam which has a backup stitch if the main stitch fails. Coverking's indoor Stretch Satin fabric is sewn with a "blind seam" which is ideal for use in the indoor, show-car conditions the fabric was designed for. 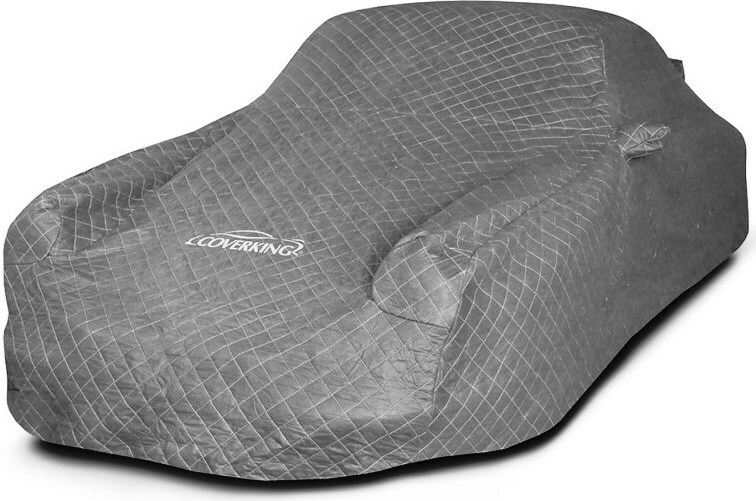 Coverking Custom Car Covers have neoprene elastic tensioners sewn in the front and rear of every cover. Protected grommets for the optional security kit are sewn in the sides and covered, so as not to be visible when the car cover is covering a vehicle. All outdoor Custom Car Covers are sewn with heavy, wax coated thread. The thin coating of wax helps to seal the fabric where the needle pierced through, reducing the chance of leakage through the seam.